The new Zeiss Conquest HD 10x32 binoculars is a lightweight model that is ideal for long range bird watching, observation and hunting. The compact size of the Zeiss Conquest HD 10x32 makes it a convenient companion in difficult terrain. 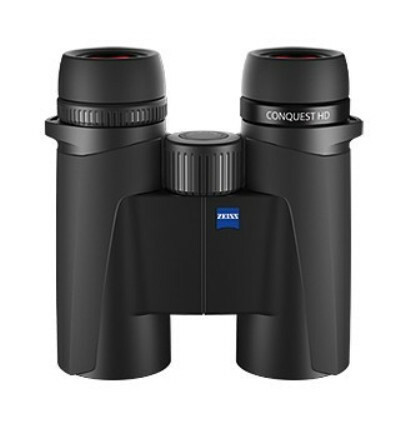 The HD-lens system of the Zeiss Conquest HD 10x32 guarantees the best colour reproduction for impressive observation. The 10x magnification provides detailed images and still an impressive field of view of 118m/1000m. The close focus range of just 1.5 meters allows you to experience crisp images and clear colours up close with the Zeiss Conquest HD 10x32. The Zeiss Conquest HD 10x32 satisfies all ergonomic requirements, among others that the focusing wheel is conveniently placed for quick and easy access. The robust and continually perfected construction of the Zeiss Conquest HD 10x32 stands the test, offering precise functionality and maximum reliability. Experience excellent observation in high definition with the Geman made new Zeiss Conquest HD 10x32.